Protect-A-Bed® mattress encasements feature a Patented BugLock® three-sided zipper system with SecureSeal™. Allergy control bedding is bed bug entry, escape and bite proof for your mattress. Protect-A-Bed® AllerZip® mattress and box spring encasements are one surefire measure to prevent bed bugs from affecting your life by putting an impenetrable barrier between you and the parasites. In fact, Protect-A-Bed® encasements are the only product scientifically proven and independently tested to eliminate bed bugs from bedding. 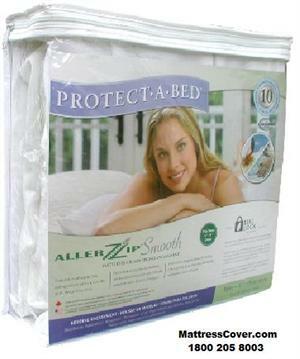 A typical mattress pad or cover cannot prevent allergens from your mattress from coming in contact with you. With the impassable material of our full mattress encasements, you can rest assured knowing that you have superior protection against any allergens within your mattress. Please email your location for S/H costs. Protect-A-Bed® anti-allergy bedding features complete protection from allergens such as dust, dust mites, dead skin, pet dander and pollen. 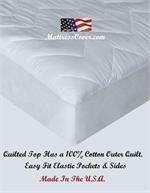 Protecta bed mattress covers isthe # 1 way to help prevent bed bugs in your mattress.